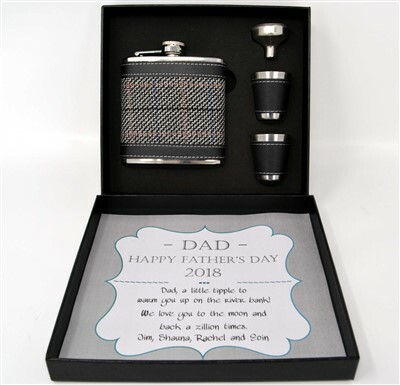 The perfect gift for Father's Day for someone who enjoys a wee tipple. The box lid is personalised with wording of your choice, please enter your requirements in the top print and bottom print box, we will arrange the text to suit the amount of words. The wording in sample is not printed as standard. A very stylish grey tweed hip flask.